"Remember - always sow the seeds. You can catch up on everything else - but if you get behind on that, there's nothing you can do about it." .... Do it now.... Every day the light is getting shorter and growth is slowing. Growing home-saved seed, and supporting small, independent and organic seed companies ensures diversity and choice in our seed supply. Preserving crop plant genetic diversity by saving our own non-F1 hybrid seeds is becoming increasingly important to future food security. Winter types of lettuce such as 'Arctic King', 'Winter Gem', 'Rougette du Midi', 'Winter Density', 'Valdor', 'Rosetta' (greenhouse/tunnel type), Jack Ice. Also Broad Beans 'Aquadulce Claudia'** or 'The Sutton'**, round seeded peas like 'Meteor', 'Feltham First', 'Pilot' etc. (protecting from mice! ), some varieties of non-hearting leafy cabbage greens such as 'Greensleeves', claytonia* (miner's lettuce), corn salad*, landcress*, spinach*, winter & Oriental radishes, salad onions (scallions), overwintering onions such as 'Hi-Keeper' (growing onions from seed avoids possibly introducing onion white rot, which may be brought in on sets). On well drained warmer soils in mild areas, it's still worth chancing a sowing of a fast-growing early carrot variety* such as 'Early Nantes' or 'Amsterdam Forcing' - particularly in southern areas - covered with cloches these may produce finger-sized roots by Christmas or certainly in very early spring. You can also try oriental greens* like Mizuna, Mustards like 'Red and Green Frills', rocket, and fast growing salad mixes* for baby leaves - all to crop this autumn if the weather is mild. All of these will benefit from being covered with cloches or fleece suspended over hoops later in the month to protect from heavy rain, or potential frost and wind damage. You can also sow all of the above undercover, in a polytunnel or frame. They will grow much more quickly in the warmer and more protected environment. You can also sow mangetout pea 'Oregon Giant' and sugar peas such as 'Delikett' and 'Delikata' - directly into tunnel soil if you have space, or in large pots and containers - all for pea shoots now, taking two or three cuts of shoots then leaving to grow on in spring to produce pods. With a little warmth you can also still sow Italian giant flat leaf parsley which is hardier and has far better flavour than the curled varieties. Sow all seeds into modules thinly to avoid overcrowding, ensure good air circulation and good drainage in order to avoid possible 'damping off' diseases in the cooler autumn weather. Lettuce in particular can be very prone to disease now, so either sow individually - or thin carefully to the one strongest seedling without damaging others, as soon as they are big enough to handle. You can also sow directly into containers under cover. Be very careful not to over-water seedlings now, always water modules from underneath by sitting in water just for a few seconds if necessary, until you can feel the compost beginning to absorb it. Watering modules from the top may also possibly encourage disease and damage vulnerable seedlings. You can also still plant rooted watercress cuttings in rich soil in a damp shady spot in the tunnel or outside under cloches - watercress is actually a perennial and will crop for a year or longer if fed, watered and picked regularly to prevent flowering. I take fresh cuttings of healthy plants every year in early autumn to provide my winter crops - removing it from the polytunnel and planting it elsewhere in a shady spot for summer. My current plants have been producing well for at least 10 years now! For a really early crop of big bulbs next year - choose firm, plump and healthy outside cloves from your this year's crop, or buy certified virus-free ones from garden centres - not supermarket bought bulbs which will most likely be unsuitable for this climate or may bring in diseases. Be careful to go through the packs in garden centres and choose the really plump firm ones. Don't buy any that feel soft, sunken or squashy as these have rotted and may be diseased. 'Christo' is weather resistant, reliable, a very good keeper and very hardy both inside and out which can also be spring planted, 'Thermidrome' and 'Marco are 'autumn planting' varieties which are both excellent for growing in the tunnel, where they produce huge bulbs planted now. Both have excellent flavour and are good keepers. All three are good in tunnels - whereas some varieties prefer outside only. The very centre cloves from the bulbs, which do not produce good bulbs later on, can be planted into pots to provide leafy green garlic shoots for cutting for salads etc. - rather than wasting them. Saffron bulbs can still be planted - many companies have good value offers now as this is late to be planting them. Bulbs will flower this year and like many other bulbs may then take a year off - but if well-fed when in green leaf after flowering, they may not do this and will then flower as normal next year. None of these are hard and fast rules, as the weather is so unpredictable now. Climates can vary widely in individual gardens and different parts of the country. You have to play it by ear depending on the conditions and you may need to adapt these instructions in order to take into account your particular garden micro-climate - it's aspect and soil, as well as current weather forecasts. Conditions can deteriorate suddenly at this time of year, and every garden is different. I always use an organic peat-free seed compost for sowing all my seeds - Klasmann which is available from Fruit Hill Farm or from White's Agri in Lusk, here in Ireland. It's an excellent, free draining compost for seedlings - I never lose any to 'damping-off' disease. Using peat composts causes the release of large amounts of carbon, which contributes to climate change, and destroys many plants which bees, insects and other creatures depend upon - thereby causing loss of biodiversity. Destroying peat bogs also leads to more flooding as bogs act like a giant sponge - absorbing water and then releasing it much more slowly into the environment. Make a cropping plan and start to make rough drafts of your seed orders as soon as the catalogues arrive or are available online. 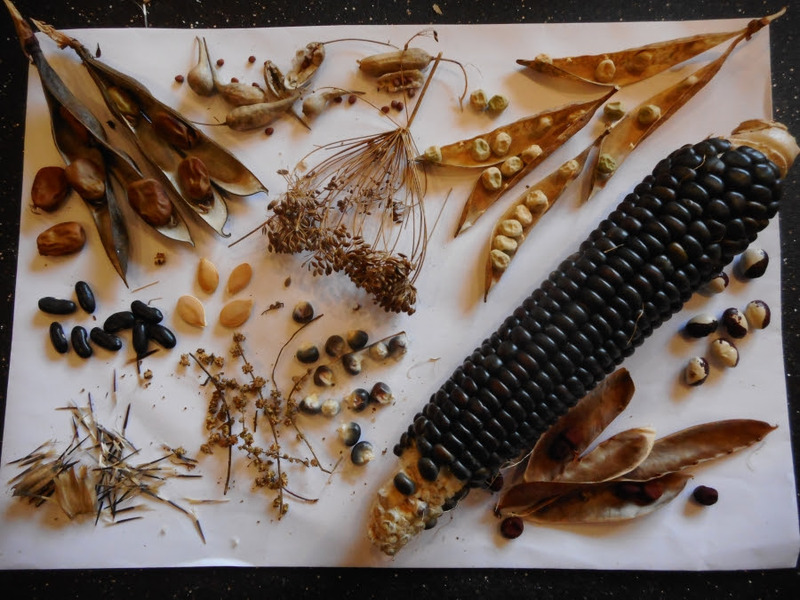 Go through this year's remaining seeds to see what will still be good for sowing next year. This avoids duplication, over-buying and prevents potential waste. Growing tips for October - as well as more information on seed varieties, growing fruit, wildlife gardening etc. can be found under the relevant diary entries for each month as they are added to the diary.